sampling some excellent home made beer and wine - that's not your normal lite beer! 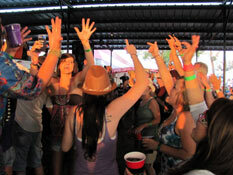 The music kicked off on Thursday night under the covered open air pavilion stage happily sponsored by Lone Star Beer - as their logo said "it's a Texas thing." Larry Joe Taylor and Davin James took over the stage around 8 and Larry Joe set the mood when he jokingly stated that "they told everyone there were be a James Taylor set in hopes to get a bigger draw!" Both are a couple of our favorites and it doesn't get much better then when the two of them get together to play. Davin James possesses a deep, rich voice; virtuoso guitar chops; and a roving muse that runs the gamut from traditional country to rock to jazz inflections to distinct echoes of Cajun and Gulf Coast blues. 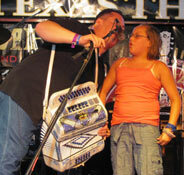 And talk about a dynamic live showman, Davin sets the example. Larry Joe Taylor songs incorporate elements of country, reggae, blues, rock & roll and an occasional twist of 50's doo-wapp but it doesn't get any better than his engaging coastal blending of Texas country music and salty melodies that are reminiscent of the slow-paced, relaxed experience of island-hopping through a long carefree tropical vacation. Davin and Larry Joe seem to be the best of buds, really enjoy playing together, are constantly joking and bantering back and forth, and their pickin' and harmonizing together are fantastic. The fans loved it. Davin was hilarious and full of energy as usual and when Larry Joe sings his coastal songs you wish your were there. If you're wondering about a couple of the pictures above, Larry Joe ask Davin to strum a few with his capo which quickly digressed to a beer bottle and the a beer can which spewed beer all over his guitar. Hated to see their set end. Next up was Chris Knight, a singer/songwriter from the tiny mining town of Slaughters, KY, who has invited comparisons to Steve Earle and John Prine. 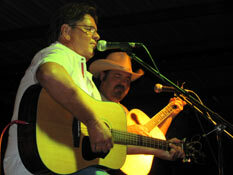 His story songs about the downtrodden of small-town America were depressing after Larry Joe and Davin's humorous set. His songs touch on opportunities lost and opportunities that never were, rural drug manufacturing, drinking for distraction, and the weighty questions that haunt those who never make it out of the woods. And then he sings them with an unaffected, straightforward backwoods drawl that sounds as natural as the wind through the trees or the lonesome howl of coyote at midnight. After the last set, the music starts again around the campground campfires and sometimes it equals what you might hear on the main stages. Campers gather together around the various campfires and take turns singing and picking and telling tales until the sun comes up. An amazing assembly of very talented singers and musicians with fiddles, guitars, thrumps, banjos, harmonicas, and pots and pans used as drums. 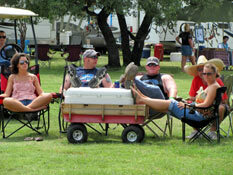 Good time and everyone is welcome to pull up a chair, pop a cold beer, and join in the playing and singing. Those who partake in the campfire festivities often come away with the desire to sign up for guitar lessons. 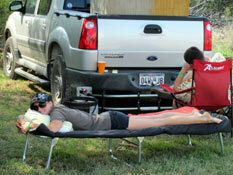 And you won't see the majority of those campfire partyer faces again until early afternoon! Friday I woke up with a sore stomach and a wet tee shirt from all the giggling and laughing and the tears from the James Taylor set. 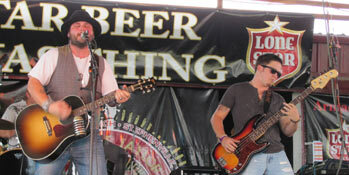 The music kicked off at 1:00 on the tented Shiner Bock acoustic stage which is adjacent to the Lone Star Band Stage. Kylie Rae Harris, a recent Stephenville resident, was first up and she's not just another pretty face (although she is very attractive) choir girl - her voice is honest and true and big and she's been compared to everyone from Bonnie Raitt to Rhonda Vincent and Kim Richey. A newcomer to Rhymes & Vines, William Clark Green entertained us with his signature cigarette-weary voice and new songs full of heartbreak, regret, satire, and hope. And last up on the acoustic stage was one of our favorites, Jed Zimmerman who is quickly being hailed as a troubadour talent comparable to the best of the last 30+ years. Jed has a way of capturing the feel of the southwest and he's an incredible singer with songs that will really move you. Here's a tidbit for ya - Jed met his wife at Larry Joe Taylor's April music festival and her brother kicked off the afternoon's music on the Band Stage. After the soothing laid back acoustic music, the Cody Gill Band with three electric guitars and a mean set of drums was a big and loud change. The Cody Gill Band is a group of small town boys from nearby Stephenville with soaring guitars, powerful vocals, driving drums, and interwoven bass grooves and a Texas red dirt and southern rock sound. Just after Cody Gill started, the power went out but that didn't stop Cody from continuing to entertain the crowd that was suddenly perfectly quiet. 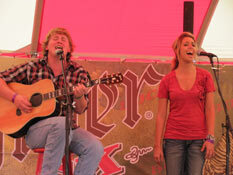 Then Jed, Cody's brother-in-law joined him on stage for a duo. 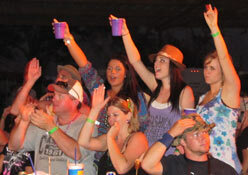 Wasn't long before the power was back and the crowd was going wild listening to the Cody Gill Band. 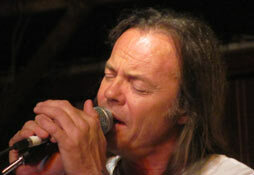 Then the pace slowed down a bit when another favorite, Kevin Welch, took the stage. 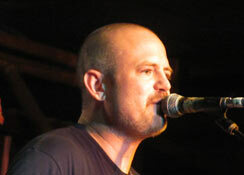 Kevin has authored songs for several artists including Waylon Jennings, Roger Miller, Trisha Yearwood, Ricky Skaggs, and the Highwaymen and he sings with passion that is unequalled. From the calm and mellow, the Six Market Blvd band got the crowd on their feet and up to the stage singing and cheering. Hailing from Stephenville, it seemed like all of Tarelton State College was up front enjoying every song that came from this talented and energetic band. 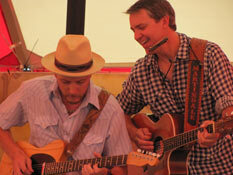 Next up was Cody Canada and Seth James - what a dynamic duo and a real special treat. 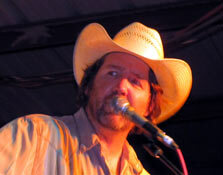 Cody Canada plays with Cross Canadian Ragweed and is a very engaging and adventurous guitarist with a smooth, powerful Red Dirt country rock sound. With a rich and earthy rasp, Seth James sang a variety of Americana that seamlessly encompassed roots rock, country, a dollop of romantic balladry, and a strong dose of roadhouse R&B. Deryl "Pearl Snap Shirt & Tony Lamas" Dodd entertained us with his highly energetic and dynamic style for the the next 45 minutes. 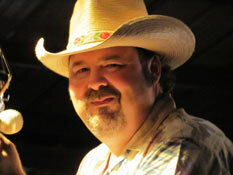 In addition to his infections stage presence, Deryl's allure is the ability to straddle contemporary Nashville and rambunctious Texas while mining his roots of gospel, bluegrass, country and rock. And the Mike McClure Band ended the evening with their lively electric guitar, organ, and rough-and-ready harmony. Mike helped start the Red Dirt sound as a part of the Great Divide and the tradition continues as he concluded another fantastic 12 hours of music at Rhymes & Vines. And the crowd loved both bands. 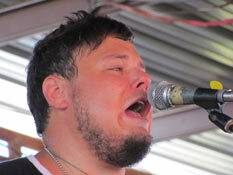 Around three on Saturday, the Joey Green Band kicked off the music and tempo on the Lone Star Band Stage with some loud, lively, and good old straight up Rock & Roll. 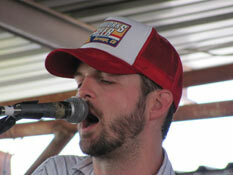 They were followed by the Josh Grider Trio. The Trio has been completely revamped with arrangements to accommodate a sparser, acoustic, Americana inspired trio with the freedom to explore other sounds and ideas, like Latin, funk and jazz, while opening up more space for bluesy improvisation focus on the universality and catchiness of the songs themselves. 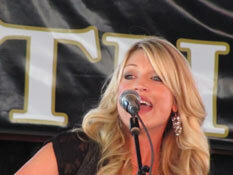 Charla Corn has now broken out on her own after supporting Pat Green, Kevin Fowler, Roger Creager, and others. This Miss Amarillo Area Scholarship Pageant winner is more than just a pretty face - she sings red dirt country with a passion and infectious, dynamic personality. 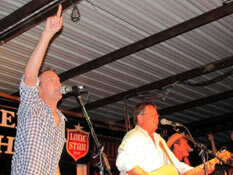 The Tejas Brothers followed Charla and keep the crowd on their feet cheering and dancing. 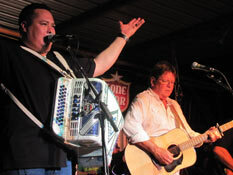 The Tejas Brothers are one of our favorites and you just can't help loving them and want to smile, dance, and sing when Dave Perez starts his dancing, singing, and accordion playing. They are really fun to watch, play a wide variety of everything from Honky-Tonk Country to Roots-Rockin' Blues to Tasty Tex-Mex and an unbelievable Luis Armstrong's "What a Wonderful World." 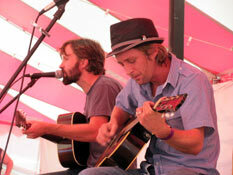 The Tejas Brothers love to get the audience involved and all too soon their set was over. The good news was that Larry Joe Taylor was up next with his fantastic mix of reggae, blues, rock & roll, and an occasional twist of 50's doo-wapp. 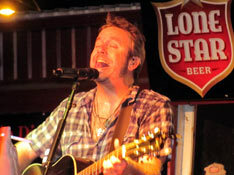 But when Larry Joe starts singing his engaging coastal blending of Texas country music and salty melodies about island-hopping and Isla Mujeres you can't help but sing along and wish you were somewhere on a beautiful Caribbean island. And it just doesn't get much better when Larry Joe and Dave Perez sang Seven Spanish Angels. Larry Joe's set was outstanding and it concluded with Matt Martindale and Larry Joe paying tribute to Rusty Wier with "Don't it Make You Wanta Dance" and a song that Larry Joe wrote and played for Rusty just before he passed away - it brought tears to our eyes and Larry Joe and others looked like they were also fighting back tears. Long Live Rusty Wier! What a fantastic couple hours! Bruce Robison's blending strains of acoustic roots music with pop melodicism and his own incisive sense of song craft, Robison is injecting a new vigor and energy into his live shows. 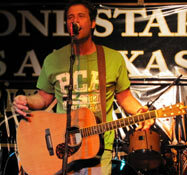 Bruce lights up the stage with strong storylines, compelling characters, and hook-laden melodies. 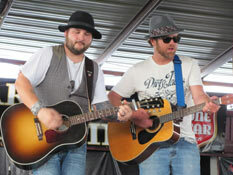 Brandon Rhyder, a well-established artist in the red dirt country, was the headliner on Saturday night. Brandon has an unmistakable and incredible supple voice and lyrics that are rivaled by few others - what a marvel to listen to and he concluded a fantastic day of music. In addition to an outstanding lineup of talented singer songwriters, what makes Rhymes & Vines fun is the camping and camaraderie. About 7 miles north of Stephenville, Larry Joe owns over 300 acres of rolling treed terrain which he has properly named Melody Mountain Ranch. And several times a year Melody Mountain Ranch morphs from some pretty farm land with grazing cows to acres full of RVs, travel trailers, and tents of all shapes and sizes and music blaring from one of several stages from 11 in the morning to sunrise the next morning - I wonder what those cows are thinking? 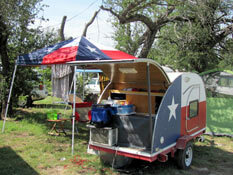 Melody Mountain Ranch has over 200 water and electric sites and a couple hundred acres for tent, RV, or trailer camping. The water and electric sites have been reserved since the first Rhymes & Vines started - once you got one, you get to renew it each year - but occasionally someone doesn't renew and an electric site may be available. 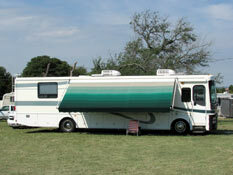 And Larry Joe adds more electric sites each year - so call early to try and reserve one. 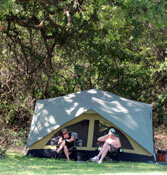 Since the crowd is smaller at Rhymes & Vines, all of the camping is less than a couple minutes walk to the stage and there are plenty of primitive sites available. Bring a blanket, snacks, and lawn chairs. This is a "BYOB" festival (no expensive $6 warm draft beer is sold here!) and everyone brings lots of it. It's not uncommon to see jello shots or quart bottles of Tequila or Whiskey or bladders of wine being shared among friends and chair mates. 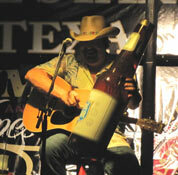 And when Rusty Wier was still around and singing, Tequila seemed to be everywhere and it's still very prevalent! God Bless Rusty. 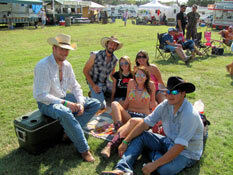 Unlike Larry Joe's Texas Music Festival in April which draws 35,000 music fans and party animals, Larry Joe purposely keeps Rhymes & Vines small (around 3500), making it more intimate and excellent for relaxing in you lawn chair and enjoying some good Texas country music. 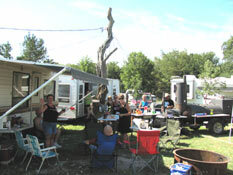 General speaking, the fans at Rhymes & Vines are older and are here for the music and for having a good time camping and partying with friends, family, and new acquaintances. 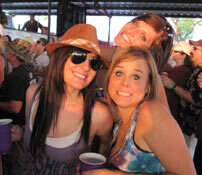 They are friendly, out going, and love a good time and good country music. Rhymes & Vines is very kid friendly. Several food vendors selling everything from corny dogs to burgers to fried twinkies to BBQ to pizza line the perimeter of the main stage. 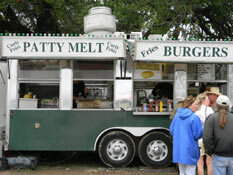 And everything that we have sampled has been excellent and is reasonably priced, but the patty melts and fries at Kate's Cafe and the freshly made wood fired oven baked pizza from Fired Up Kitchen are to die for. Kate's Cafe also serves great burgers, chicken sandwiches, and excellent fries - all of which are freshly cooked to order. And if you like pizza, Fired Up Kitchen serves some of the best we have had - the Texan with jalapenos, goat cheese, and more was delicious and quickly devoured. 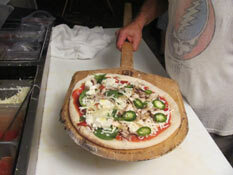 All of the pizzas are cooked to order in an authentic Wood Fired Oven that was imported from Italy. Around 5PM on Sunday, Melody Mountain Ranch started to return to it's normal state - the cows came back to the pasture, the bobcats, birds, fox, and deer returned to the trees, and the rabbits and squirrels said "wow, that was fun. 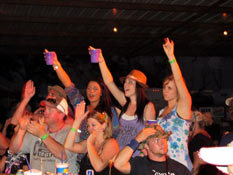 And to think we only have eight more months and the music and fun will start again at Larry Joe's Texas Music!" 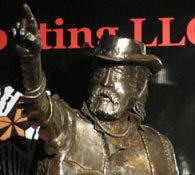 Our thanks to Larry Joe, Zack, and Sherry Taylor for all the hard work they put into hosting this fantastic festival. And thanks to all the volunteer and workers like Joe Dye for helping this festival remain one of the best. 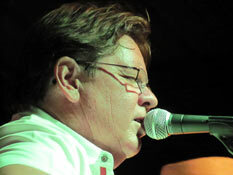 If you like country music and Texas singer songwriters then you need to add Rhymes & Vines to your 2011 calendar. Another festival to add is Larry Joe's Texas Music Festival which is a much bigger version of Rhymes & Vines and held in April. You can check it out by buying a new Tunes & Tales CD/DVD that's all about this fun and lively festival.